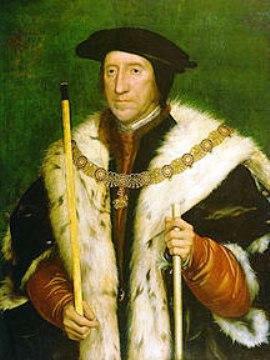 The researchers will first analyse the great Renaissance monuments of Thomas Howard, third Duke of Norfolk (d. 1554) and of Henry Fitzroy (d. 1539), Duke of Richmond, Henry VIII’s illegitimate son. Both monuments seem to have been dramatically altered when they were moved in the middle of the sixteenth century from their original locations in Thetford Priory to Framlingham Parish Church, where they now stand. Puzzlingly, pieces excavated at Thetford in the 1930s seem to have originally belonged to these monuments and this suggests that they used to look very different from what we now see. 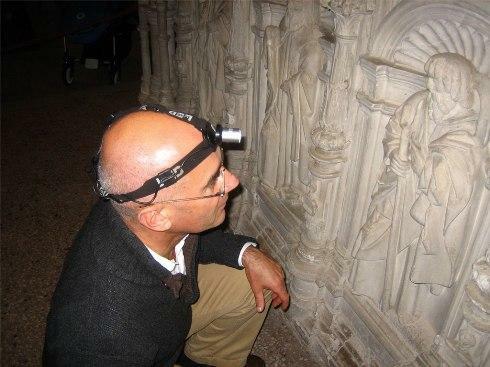 Dr Phillip Lindley examining the Renaissance sculpted tomb-monument of Thomas Howard, Duke of Norfolk. Credit: University of Leicester. With scanning and analytical techniques borrowed from space science, all this can be done virtually, without even touching the monuments. Materials analysis (using X-ray fluorescence (XRF) , RAMIN, and other non-destructive techniques) developed for space science applications, will provide information about the original painted surfaces. The project will function as a case study, adapting techniques for analysis, interpretation and display, to make them widely transferable, and to further the innovative deployment of science into the cultural heritage sector.